Living in a city that's quite hilly in places, street patterns make a lot more sense if you can see how they interact with the landscape. The inclusion of elevation data adds legibility to a map, and in the case of the Bay Area it's also interesting to see how overall urban development hugs the flatlands in most places. My goal here is still a beautiful map of Oakland for use with Oakland Crimespotting, with street-level details like schools, hospitals, and major buildings included. I've just pushed a major update to the Bay Area cartography I've been working on. When I last posted about it in September, I had just added the Cascadenik CSS preprocessor to Dane's mapnik-utils repository. 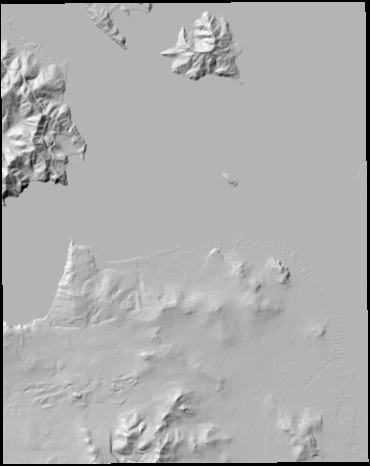 I was inspired to investigate elevation data by Andy Allan's addition of hill coloring to his award-winning OpenCycleMap project, and spurred on by finding the USGS BARD 10-meter elevation data for the San Francisco Bay Area. Now I had two problems. One was that the shading algorithm trims a single pixel off the edges of its input, because it can't correctly figure out the slope on the border of an area without data. The other was that the BARD *.dem files are published in a mix of meters and feet, so some sections appeared to have an exaggerated height compared to others. 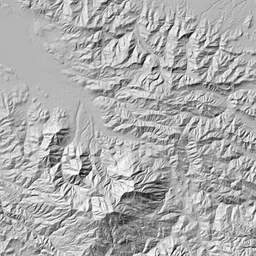 Happily, the heavy lifting of dealing with geographic raster data turns out to be mostly handled by the amazing GDAL library, so it was easy to write a Python script to stitch adjoining elevation files together into larger, overlapping, normalized panels and adjust for the feet-vs.-meters problem (stitch.py, 8K). It was also easy to port the C++ hillshading program to Python, which let me fine-tune some other annoying problems around the edges (hillshade.py, 4K). The library I use to generate map tiles, Mapnik, has a way to get raster images into a map, but it doesn't yet support niceties like warping or smooth interpolation. I still have a giant bag of multi-purpose tiling code sitting around from all my flea market mapping experimentation, so this turned out to be an easy step. 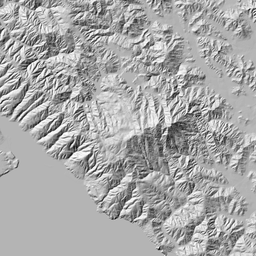 I warped and tiled all the overlapping bits of shaded hill into a smooth, grayscale tile set that covers the entire SF Bay Area up to zoom level 15. I've also included a permissive crossdomain policy file, so these can be used in Flash unencumbered. The other thing lacking in Mapnik's RasterSymbolizer is a way to choose how a raster image visually combines with other cartography, so this ended up being a somewhat custom operation as well. I started with the OpenStreetMap style.mml style file I included as part of Cascadenik example data. I moved some roads up and down in the layering order, and made it split cleanly into two separate styles: ground.mml for ground cover, parks, and roads at very low zoom levels, and figure.mml for labels, buildings, bridges, symbols, and so on. The idea is that figure.mml and ground.mml together should look identical to style.mml, but that the split provides a convenient place to slip in a grayscale set of hills to lighten or darken the ground as necessary. I implemented a version of Photoshop's Hard Light transfer mode because it seemed to look best in this situation. I also added a feature request to Mapnik in the hopes that this sort of thing will be a built-in feature of the library sometime. Check out the current version of the map for the results. 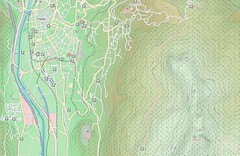 OpenStreetMap and OpenCycleMap's own tiles are included on that page for comparison. If you see a mistake, you can correct it yourself or just mark it as a bug. 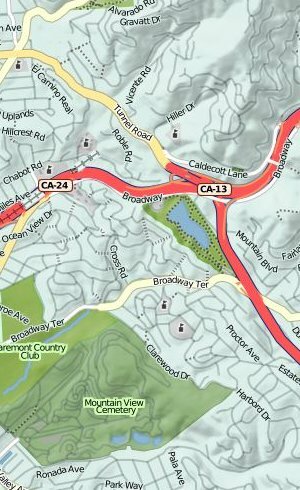 Excellent work - the map is beautiful and oh-so-handy for a cyclist. I'll also throw in belated admiration for Cascadenik which is an awesome idea. 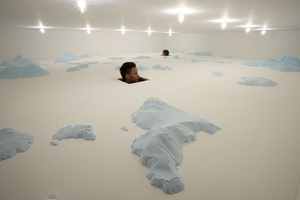 Aside: That PS1 installation in your opening image was fantastic - though I did have a run-in with a docent after sneaking a camera into the "head space". What an amazing weaving of GDAL, python, and good looks - I'm floored. And thanks for doing the 'good work' of open source and filing solid tickets. One I'd add to the list in case you've not bumped into it is: http://trac.osgeo.org/gdal/ticket/2640 (for integrating Matt's dem tools into the gdal utilities). Thanks! stunning. the bay area makes sense. thanks for documenting it all. wonder about the effect of exaggerating the slope. san francisco in particular seems less steep that the reality because the height is not great. Beautiful stuff, well done! The tech details are over my head but the end results are excellent. As I do much of my OSM mapping by bike, I often think a map like this would be a much better representation than the standard mapnik or osmarender styles. Great work Mike!!! Can you explain how You "implemented a version of Photoshop's Hard Light transfer mode"? Tnx Mike. 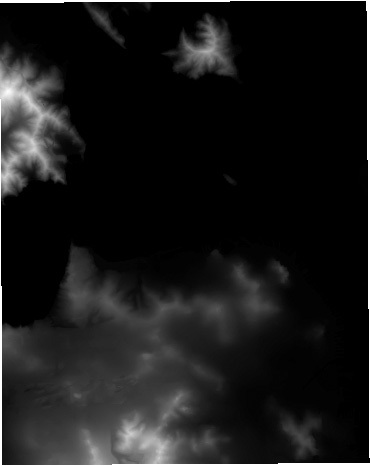 At the weekend I find more poverful solution to manipulate with srtm dems. I try povray raytracer tool. Try out this .pov script http://dpaste.com/hold/99231/ ... it requires povray instaled on your machine. Before tracing you must convert tiff to png (gdal_translate recommended) and just start command povray +W6000 +H6000 test.pov -D +P +A +dem.tif (where W=with H=height of your png). You can play with colors and camera and it seems very poverful tool for visualize dems. What You think?